Go See 12-12-12; Support A Good Cause! About a year ago, some great names in entertainment came together to support New York City. Why? Well, The City (and part of Jersey & Connecticut) had been hit by Hurricane Sandy. Homes were destroyed, flooded, and abandoned. Memories were lost. People were scared. 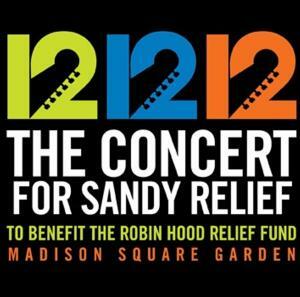 You may remember the 12-12-12 concert and this disastrous event, but you’ve never seen it like this. Today, in select cities, 12-12-12 the film is being released with proceeds still going to support the Robin Hood Hurricane Sandy Relief Fund. The film takes a behind-the-scenes look at how the event came together with some delightful banter from the producers of the event themselves (Harvey Weinstein, John Sykes and Jim Dolan) and a detailed look into the musical collaborations of the night. If you’re a computer nerd, even slightly, you may especially enjoy when the internet servers couldn’t maintain the capacity of requests for donations and the event producers grab Eric Schmidt (Google) out of his seat to help. “Just give a minute,” says Eric calmly. Beyond that, you’ll get to relive the concert experience from Bruce Springsteen’s bone-chilling yet empowering versions of “My City in Ruins” and “Wrecking Ball” to Billy Joel’s “Miami 2017” which he once wrote as science fiction and watched come true during Sandy. And that’s just a taste of a set list that also includes performances by The Rolling Stones, Sir Paul McCartney (WARNING: “Live and Let Die” might make your eyes water), The Who, Bon Jovi and more. There’s just nothing about this film that isn’t worth the added investment; even if you watched it live on December 12, 2012. Global warming is real. We don’t know whose town will be affected next. Support humankind where you can and this holiday season lets spread a little more goodwill. Adam Sandler performing at 12-12-12.